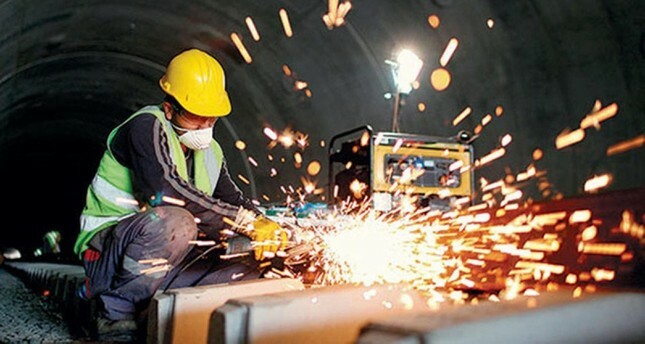 Turkey's calendar-adjusted industrial production in December 2018 decreased 9.8 percent from the same month the previous year, the Turkish Statistical Institute (TurkStat) announced on Thursday. Industrial output is considered a vital indicator for the economy, as it is seen as a preliminary gauge for gross domestic product (GDP). The industrial production index stood at 117.3 points in December, compared to 130 points same month last year. The annual average of the index also stood at 114.5 points. Among three main sub-indices, the manufacturing index saw the largest annual decline in the month, falling 10.8 percent from December 2017. The mining and quarrying index and electricity, gas, steam and air conditioning supply index fell by 2.1 percent and 1.2 percent year-on-year, respectively. The term "calendar-adjusted" is used to refer to data without calendar and holiday-originating effects. December's figure was below expectations. According to a survey conducted by Anadolu Agency on Monday, the median estimate for annual industrial production in December 2018 was a decrease of 7.2 percent. A group of 10 economists forecast the seasonally and calendar adjusted index to increase 0.8 percent on a monthly basis. The production level was also lower than the same figure for November 2018. "Industrial production [in December 2018] decreased by 1.4 percent compared with the previous month," TurkStat said in a statement. On a monthly basis, the mining and quarrying index slightly rose by 0.1 percent in December last year. The manufacturing index fell 0.8 percent, while the electricity, gas, steam and air conditioning supply index saw a decrease of 1.6 percent in the same period. Producers of durable consumer goods saw the largest decrease -- 7.4 percent month-on-month -- in December 2018 among the main industrial groupings (MIGs).